Spring in rural Indiana is a time of seasonal transition, from the cold ambience of winter, to warm, humid days interspersed with welcome rainstorms. It was only a week before Easter. Already the grass was green, flowers were budding, and the dogwood in the front yard had bloomed. Sitting in church on Palm Sunday morning, it was hard for to remain undistracted from the sounds of other kids playing outside in the unusually warm temperatures. Besides, I couldn't wait to get home and out of the starchy clothes -- cousins and relatives were coming over for Sunday dinner. Though sunny and hot, it was a relaxing afternoon under the shade trees sipping on lemonade with family. As dusk approached, the familiar sight of dark clouds were accumulating in the west. Distant sparks of lightning could be seen on the horizon, meaning a typical Midwest storm was brewing. The family had gone indoors and were watching TV when news of a tornado warning scrawled across the screen. Such warnings are frequent and didn't generate much concern until the program was later interrupted by a urgent news bulletin. They reported that moments earlier, a twister had devastated a community 15 miles to our west, and was headed due east, directly in our path. We were alarmed and realized it was time to take refuge in the basement. My dad was the last of us to arrive below when the lights suddenly went out. We were fumbling to find a flashlight, when there was a hush. "Do you hear that?" Mother whispered. We stood motionless, straining to hear what seemed to be the increasing sound of a distant roar. But in mere seconds, the noise had become a rumbling vibration that was now shaking the structure above and around us. Instinctively, we each knew the danger that was upon us, but there was no time to react. My heart was pounding in my chest. Behind me I could hear my mother's soft, familiar voice calling out to the Lord for His help. "Dear Jesus, please help us!" Then suddenly we heard and felt the impact of a massive collision. The house shook violently -- we were deafened by the sounds of breakage and the groanings of timbers being twisted and torn. Suspended in shock, all eyes peered out helplessly from the small basement window. In the dim light we could see a blurry collage of objects hurling past from the wind's great force -- trees, farm machinery , huge objects. Near the window, a small tree bent completely to the ground without breaking. Then as quickly as it had begun, there was silence. The tornado had apparently passed. We carefully emerged from the basement, and to our surprise, we found the house intact. But when we pushed the front door open, the surrounding devastation was beyond belief. It appeared that a nuclear bomb had exploded. Fallen trees, portions of buildings, automobiles, clothing, home appliances -- mangled debris of every kind covered the ground and hung from disfigured trees in all directions. We had no injuries, but later we would discover the toll was more severe just a few miles up the road, where thirteen of our neighbors and friends were killed. 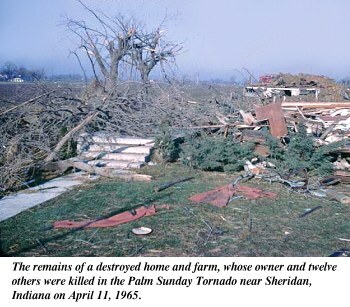 All together, this and several other twisters in Indiana took the lives of 60 on the same day. I knew that we were fortunate to be alive, but didn't realize the divine significance of this until later hearing the account of our neighbor from across the road. When he saw the funnel cloud coming, he quickly gathered his family in the car and raced away from its path. After reaching a safe distance away, he stopped and watched as the twister destroyed his home, then proceeded toward ours. "I knew that if you were there, it would be all over for you," he said. "But a strange thing happened. 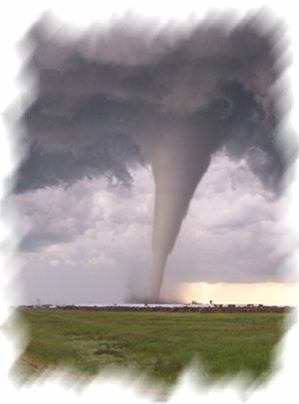 When the twister reached your driveway, I saw it lift up over your house and come down on the other side!" As he said this, a tingle went up my spine! I realized this was same moment that my mother was praying, "Dear Jesus, please help us!" That day, my life was forever changed. Perhaps for the first time in my life, I understood that prayer really works. Its power became a living reality to me, through the legacy of my mother's faith. Never would I forget this tremendous revelation, nor the miraculous answer to prayer which saved our lives on Palm Sunday, 1965. Over the years, I've come to value the power of prayer more and more. Each day, as well as in times of crisis and distress, I've discovered that He is always there to strengthen and help His children, to respond to their pleas. And regardless of the size of problems that we may face -- whether the fierce winds of a cyclone or the daily challenges of life, Jesus is there for you. Just call upon His name in faith and put your trust in Him. "He shall call upon me, and I will answer him: I will be with him in trouble; I will deliver him, and honour him. With long life will I satisfy him, and show him my salvation." (Psalms 91:15-16). This article (VL-601) is copyrighted © by Dr. Dale A. Robbins, 1990-2019 and is a publication of Victorious Publications, Grass Valley, CA - Nashville, TN. Unless otherwise stated, all scripture references were taken from The New King James Bible, © Thomas Nelson Inc., 1982. You may download this article for personal use as long as you retain credit to the author. Obtain permission before reproducing copies for any reason, by filling out our simple use permission form. Many of our writings are also available as free pdf tri-fold pamphlets, which can be downloaded for reproduction from our Online Catalog. For media reproduction rights, or to obtain quantities of this title in other formats, email us. If you have appreciated these online materials, help us reach the world with the Gospel by considering a monthly or one-time tax-deductable donation.